Who put the New in New Cumnock? 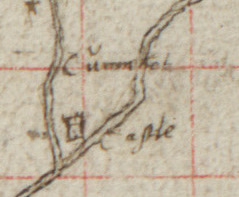 In 1650 the Commissioners for the Plantation of Kirks deemed it unsustainable that the huge parish of Cumnock could be supported by only one kirk and one minister and consequently divided it into the two new parishes of Old Cumnock and New Cumnock. The existing parish church of Cumnock served the parish of Old Cumnock and was located at what is now the heart of the town of Cumnock. A new church was erected to serve the parish of New Cumnock and was built on the castlehill adjacent to Cumnock Castle, the ancient seat of the barons of Cumnock, overlooking the confluence of the Afton Water and River Nith, at the heart of what is now the village of New Cumnock. While there are no remains of the original parish church of Old Cumnock nor indeed of its successor the ruins of the parish church of New Cumnock built in 1659 and now affectionately known as the Auld Kirk still stand on the castlehill – a tangible reminder of where the ‘new’ in New Cumnock originated. So what about the name Cumnock? When considering the origins of the name Cumnock many place-name experts and enthusiasts alike understandably look to the modern day town of Cumnock and its environs for clues. In doing so they are either unaware or ignore that the baronial seat of of Cumnock was situated at New Cumnock. Cumnock Castle stood on the castle-hill, Cumnock Maynes now Castlemaines stood on the banks of the Afton Water and the wheel of Cumnock Mill was turned by that same sweet water. 1: Cumnock Castle, 2: Cumnock Maynes (Castlemaines), 3. Cumnock Mill, 4: New Cumnock Parish Church. The earliest recorded Baron of Cumnock is Patrick, 8th Earl of Dunbar who appears in the Ragman Roll (1296) as Patrik de Comenagh. Other early forms of the name Cumnock include Comenoc, Cumno, Cumnoch and Cumnok. The name appears to comprise two elements with the second element or suffix varying from –agh, –oc, –o, –och, –ok an –ock which strongly resemble the development of Gaelic achadh in Scots and English . This Gaelic achadh ‘field’ is common as a prefix and is found in the anglicised form in the parish of New Cumnock in the farm names Auchenghee (‘field of the geese’) and Auchincross (‘field of the cross or crossing’). As a suffix it typically translates as ‘place’ rather than ‘field’ and is found in New Cumnock in the farm name of Beoch which is Gaelic beithe achadh ‘place of the birch’. Turning to the first element of the name Cumnock it is worth noting that Celtic place-name expert WJ Watson  identifies Gaelic comunn ‘confluence’ and gives Comunn nan Caochan ‘confluence of the streamlets’ as an example. Cumnock therefore may originate from Gaelic comunn achadh ‘place of the confluence’ or ‘meeting place’ in the sense of a meeting of the waters of the Afton and the Nith close to where stood Cumnock Castle, Cumnock Maynes and Cumnock Mill . 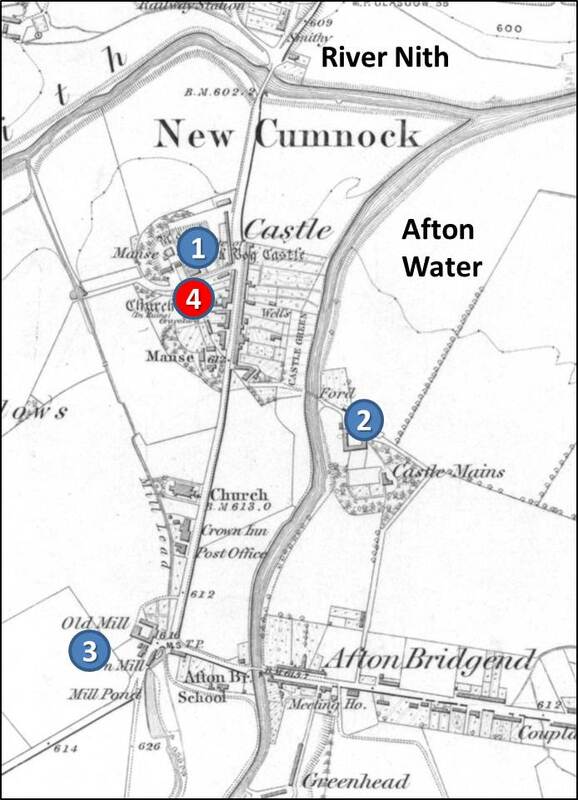 It is a fitting coincidence that the name ‘Cumnock’ in New Cumnock in Ordnance Survey maps appears sandwiched between the Afton Water and River Nith. Even more powerful however is the depiction of Cumnock Castle in Timothy Pont’s ‘Kyle Provincia’ of the late 16th century nestling in the piece of land between the Afton and Nith once known as comunn achadh.